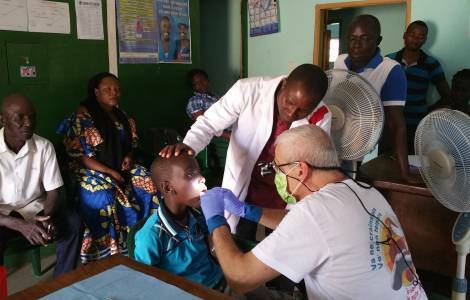 Kolowaré (Agenzia Fides) - "After several months of preparation and prayer, working on the draft 'A smile for Africa', and after constant daily attention to what the Lord wants from us, finally at the end of July 2018 we left for our mission in Kolowarè": thus begins the story of Francesco Andaloro, a Catholic dentist, who, together with his wife, started the first health-odontological mission in the Togolese village. "The project came from our heart, after some reflections which arose from a previous experience in the Democratic Republic of Congo and after participating in the 'School of the Word' held by the priests of the Society for African Missions (SMA) and Missionary Sisters of Our Lady of the Apostles. The reception received by the Council of SMA and the nuns was fantastic and so we developed the details, buying all the equipment that we considered important and necessary and planned the first mission in Kolowaré", says the Italian doctor. Andaloro continues: "Once we arrived on the spot, people came from all the nearby villages and also from the city. We assisted more than 130 people, noting that in people over 30, there is an absolute need for care and above all there is no form of prevention or education for oral hygiene. Moreover, the population is so poor that most of them cannot afford to pay any kind of treatment. During our stay, in addition to treating the patients who presented themselves, we held a small course for nurses at the center on dental prevention, another for children with AIDS. In addition, we also went to Sokodè to visit patients who subsequently came to be treated in Kolowaré". The mission lasted 24 days. The village was founded in 1935 to treat lepers and became an important health center, as well as a point of reference for the sick with AIDS (see Fides 17/9/2017). "We have now equipped a dental clinic. The goal is to go at least twice a year to places that will be reported to us by SMA missionaries or nuns", concluded Dr. Andaloro.